It’s time to make your life easier. Our goal is to provide the ag producer with farm and ranch software that will make record keeping easy while maximizing profitability. EasyFarm saves you time, money, and eases the hassle of farm record-keeping. All while providing in-depth reports, crop & field tracking, livestock management, and many more features. Our newest feature expands your crop record-keeping abilities to an Android device with EasyFarmHand. EasyFarm was first created in 1993 in response to local farmers requests for a way to track records significant to farming. Now, after nearly 20 years of field use, EasyFarm has a track record that is unmatched in both price and performance. If you are ready to step up to a full featured, fully supported, easy to use management tool, give EasyFarm a try! 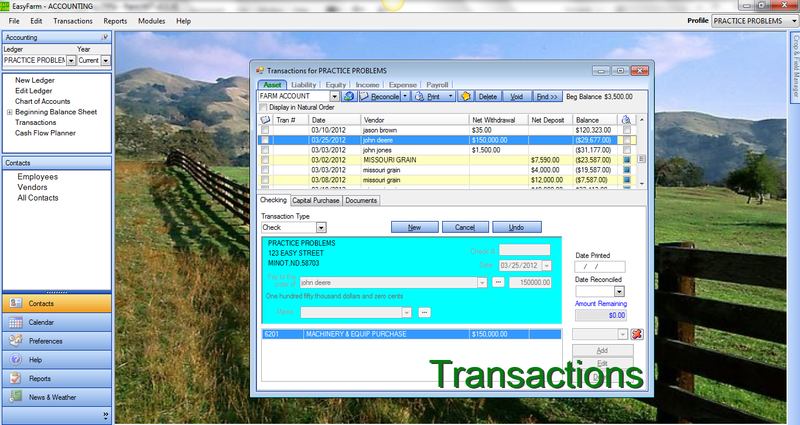 EasyFarm uses a single-entry input approach when recording transactions. You input a single entry and it takes care of the rest. There’s no closing months or posting transactions. Everything is done in real-time! With easy input screens, powerful reports, and complete flexibility you will soon wonder how you got along without EasyFarm. You can purchase items like seed, feed, or chemicals – expense them and put them on inventory in one entry. Whether it’s crops, livestock, machinery, fuel, seed, or inventory, you can track it simply and easily in EasyFarm. 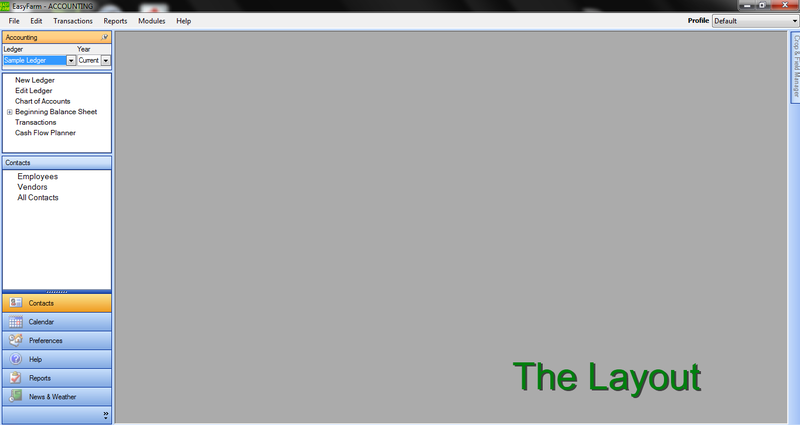 The inventory module allows you to run beginning and ending balances for both dollars and quantities. Inventory is easily adjustable as you progress through the year. All new EasyFarm Version 8. Completely redeveloped. Reports on the fly, anytime. Generated from your data. 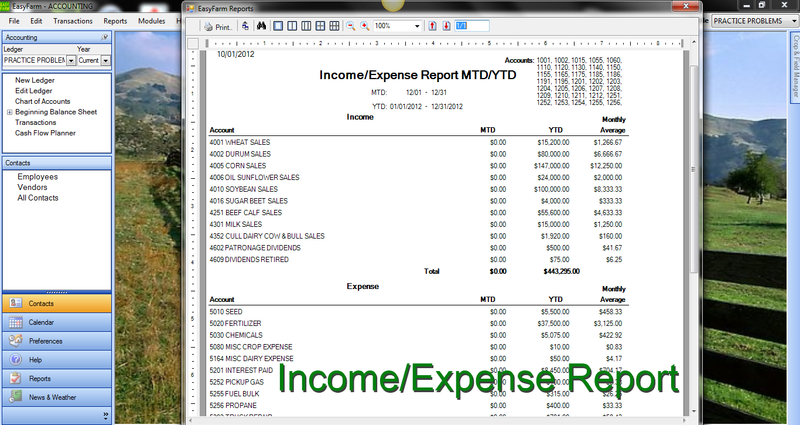 Double entry accounting, with single entry input. 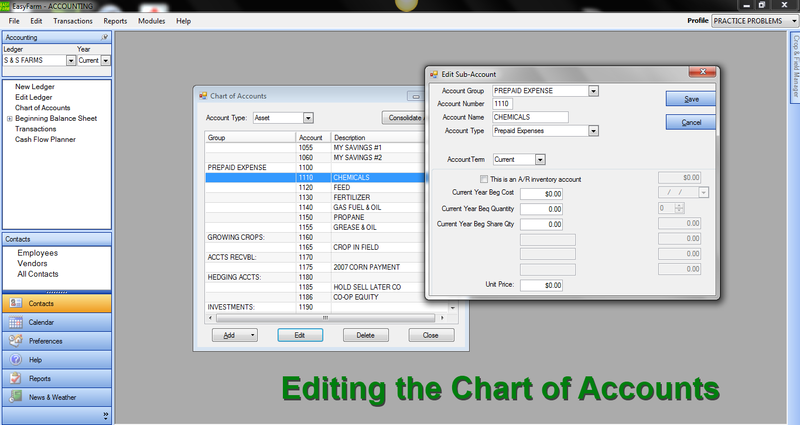 The Chart of Accounts, easily modified. (C)2011-2018 Vertical Solutions Inc. All Rights Reserved. Website Developed by The Small Business Platform Inc.